SUKKUR: The Sindh government is likely to open branches of the National Institute of Cardiovascular Diseases (NICVD) and Chest Pain Units (CPUs) in other provinces so as to ensure free cardiac treatment to the people of Pakistan. This was disclosed by Executive Director of the National Institute of Cardiovascular Diseases (NICVD) Prof. Nadeem Qamar who also offered free cardiac treatment to former premier Mian Nawaz Sharif at the Sindh government’s top health facility. The executive director also inaugurated an electrophysiology lab and the second catheterization (cath) lab at the NICVD’s Sukkur Satellite Center the other day, saying these new facilities would now facilitate a larger number of patients requiring pacemaker, ICDs and other implants and angioplasties from Northern Sindh, Southern Punjab and entire Balochistan Province. “On the first anniversary of NICVD Sukkur, we are going to inaugurate an electrophysiology lab and the second cath lab which would benefit thousands of patients from Northern Sindh, Southern Punjab and entire Balochistan province. NICVD Sukkur has now become one of the best cardiac-care hospitals in entire Pakistan where patients even from New York and London can come for quality cardiac treatment without any charge”, Prof. Qamar said while addressing a news conference on the occasion of first anniversary of the completion of NICVD Sukkur. On the occasion, he cut a cake to mark the first anniversary along with senior cardiologists, professors and cardiac surgeons, attended presentations on the performance and issues facing the hospital and visited different wards and sections of the healthcare facility. Prof. Nadeem Qamar also announced establishment of the first Chest Pain Unit (CPU) of the NICVD outside Karachi within a couple of weeks and vowed to establish chest pain and heart-attack management units in entire Sindh so that lives of people could be saved in case of heart attacks. “We are running one of the best chest pain and heart-attack management programs in the world and our 8 CPUs in Karachi have saved over 5000 lives in a single year, which is incomparable performance by any means in the world”, Prof. Qamar said, adding that every district of Sindh and major towns would be equipped with chest pain units so that people could be provided timely first aid in case of heart attacks. 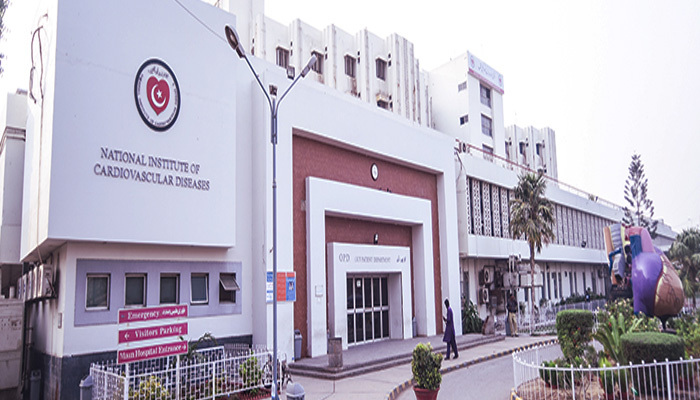 He maintained that with the establishment of electrophysiology lab, now all types of device implants including pacemakers, ICDs would be performed at the NICVD Sukkur, which would benefit thousands of people from entire Pakistan. “We are also going to start pediatric cardiac surgeries at NICVD Sukkur very soon”, he announced. Praising the team of cardiologists running the NICVD Sukkur center, which started functioning by the start of March 2018, he informed that so far 201 bypass surgeries had successfully been performed at the hospital with only one mortality and claimed that it was the best performance by any cardiac-care hospital in the world. “Since its establishment, around 56000 patients were treated in the OPDs, over 58000 patients visited our emergency while over 9000 children were examined at the pediatric OPDs at the hospital”, he said and added that during last one year, 12553 patients were provided the facility of Primary PCI, which a type of angioplasty performed following heart attack. Prof. Qamar claimed that over 166,000 patients from all four provinces and even Azad Kashmir and Gilgit Baltistan had been treated since March 2018 at NICVD Sukkur, adding that a few years back, nobody could have dreamt of such a sophisticated and state-of the-art hospital in this part of Northern Sindh. To a query, he said NICVD has also launched a preventive cardiology program which is being led by a senior cardiologist but added that this program could not be succeeded without the collaboration of federal and provincial governments, doctors and media, and urged the national and local media to create awareness about heart disease, which was now the leading cause of death among Pakistanis. Responding to another query, he said a review petition has been filed by the provincial government and hoped that NICVD would continue to remain in the administrative control of Sindh government, which is spending billions of rupees to provide cardiac care facilities not only to people of Sindh but also to the people of other provinces of Pakistan. “But even if this facility is run by the federal government, they would have to run it like Sindh government and provide free of charge quality treatment otherwise it would be a political disaster for them”, he observed.